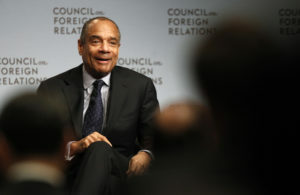 Facebook announced today that departing American Express CEO Kenneth Chenault will join its board of directors, a move that comes as the social media giant is trying to diversify its all-white, mostly male board. Mark Zuckerberg, founder and CEO of Facebook, said in a statement provided to the PBS NewsHour that he had been trying to recruit Chenault for years. Chenault announced last year that he would stepping down as American Express CEO in February 2018, after 16 years in the role. Chenault will officially join the Facebook board on Feb. 5. The announcement comes months after Facebook’s chief operating officer Sheryl Sandberg promised to name a black director to its board. In October, Sandberg met with the Congressional Black Caucus, which criticized Facebook for hosting what was later discovered to be Russian ads designed to inflame racial tensions during last year’s presidential election. They also slammed the company for being too slow in addressing these concerns. Silicon Valley has long struggled with, and received scrutiny for, its lack of diversity, including over a leaked Google memo in August 2017 that criticized the company’s efforts to attract and retain more women. “What we needed Facebook to understand is that they play a role in the perception of African-Americans, and they are influencers that use their platform to influence this country,” Cedric Richmond, CBC chairman, told reporters after the meeting. Sandberg told the black lawmakers then that the company had plans to add an African-American member to its board “within the foreseeable future.” No indication was given then on who the company was courting for the position. Chenault joined American Express in 1981, and became its chairman and CEO two decades later. He also serves on the board of Proctor & Gamble and IBM and several other nonprofits, including the Advisory Council for the National Museum of African American History and Culture and the Bloomberg Family Foundation.